Two days after being transported from Sierra Leone to a medical facility in Nebraska, Dr. Martin Salia has died of Ebola, hospital officials confirmed Monday. A legal resident of the United States, Salia split his time between Maryland, where he lived with his family, and Sierra Leone, where he worked as a surgeon at a Methodist hospital. Salia, who was a native of Sierra Leone, did not treat Ebola patients there, and it's currently unknown how he contracted the deadly virus. Salia was rushed via an ambulance aircraft from the Sierra Leone capital of Freetown to Nebraska Medical Center in Omaha Saturday afternoon. The prestigious Nebraska hospital has a biocontainment unit — commissioned nearly a decade ago by the Centers for Disease Control and Prevention — where two other Ebola patients were successfully treated. It is with an extremely heavy heart that we share this news. Dr. Salia was extremely critical when he arrived here, and unfortunately, despite our best efforts, we weren’t able to save him. We used every possible treatment available to give Dr. Salia every possible opportunity for survival. As we have learned, early treatment with these patients is essential. In Dr. Salia’s case, his disease was already extremely advanced by the time he came here for treatment. Salia was placed on a ventilator and dialysis as soon as he arrived in Omaha, Smith said. 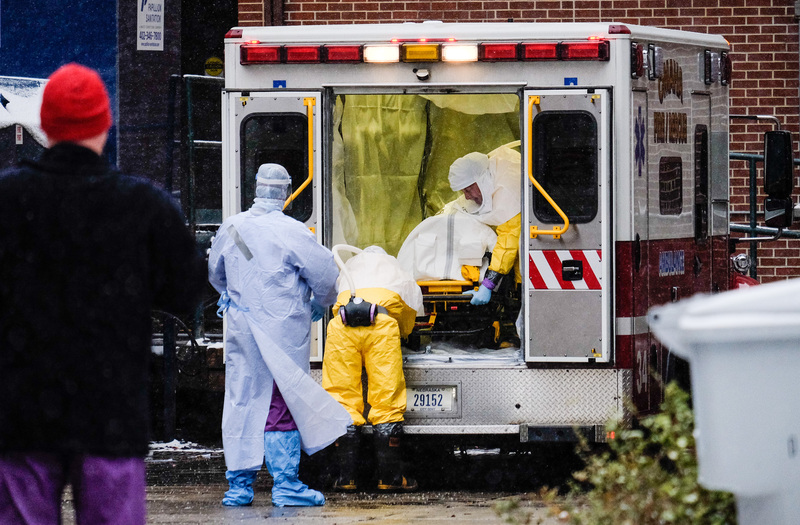 He was showing "advanced symptoms" of Ebola, including kidney and respiratory failure, and needed multiple medications to support his organs. Smith added that Salia received doses of ZMapp, the experimental drug thought to help Ebola patients survive, and convalescent plasma. We're very grateful for the efforts of the team led by Dr. Smith. In the short time we spent here, it was apparent how caring and compassionate everyone was. We are so appreciative of the opportunity for my husband to be treated here and believe he was in the best place possible. It was clear before Salia arrived in the United States that his situation was more dire than the previous patients who contracted the virus in West Africa. The health team caring for the surgeon in Sierra Leone had said that he was seriously ill, and Nebraska Medical Center officials said on Saturday that Salia was in "extremely critical condition," CNN reported. However, an air ambulance crew that evaluated Salia in Freetown last week determined it was safe for him to travel to the United States.When Salia arrived in Nebraska Saturday afternoon, he did not walk out of the ambulance like many of the Ebola patients treated here in the United States. Photos show Salia strapped to a stretcher, protected in a special chamber. Salia worked at Kissy United Methodist Hospital — a medical center that doesn't admit Ebola patients. However, CNN reported that he may have provided medical centers at several other hospitals in the region, where he may have come in contact with Ebola patients. He told us he knew the situation back home when this Ebola started. The fact that he would go back to his country and help is one thing that really amazed me because he showed the love that he has for his country. The fact that he left here and went back to his country, that made me worry a little bit, especially when he’s a doctor, and he treats patients because he doesn’t know who has the virus.